A recent report published by Infinium Global Research on wound biologics market provides in depth analysis of segments and sub-segments in global as well as regional wound biologics market. 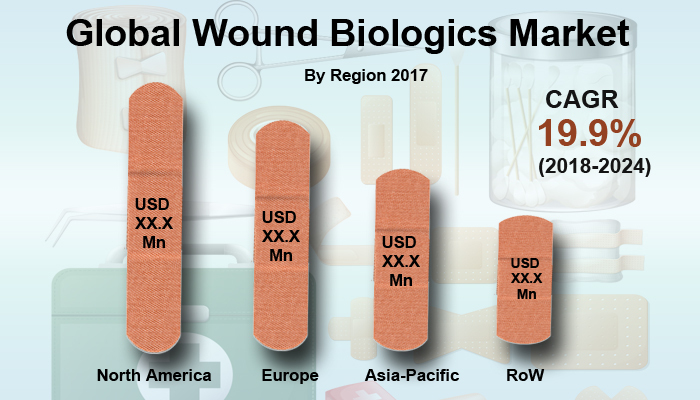 The study also highlights the impact of drivers, restraints and macro indicators on the global and regional wound biologics market over the short term as well as long term. The report is a comprehensive presentation of trends, forecast and dollar values of global wound biologics market. According to report the global wound biologics market is projected to grow at a CAGR of 19.9% over the forecast period of 2018-2024. The wound healing is a complex process that involves the activation and synchronization of intracellular, and extracellular elements. Wound is healed with tissue regeneration and scar formation. Wound biologic healing helps in re-establishment of the natural repair mechanisms, which includes the application of active biological agents, such as plant-derived active biomolecules which reveal antioxidant, antimicrobial, or anti-inflammatory attributes. The report defines wound biologics market as a product types of wound biologics such as skin substitutes and growth factors. Biologic skin substitutes have a wide range of applications. The increasing demand for tissue-engineered and cell-based therapies for the treatment of chronic wounds, skin substitutes are used. Frequent occurrence of skin diseases, chronic wounds, rising incidences of burns and harmful accidences are the factors driving the growth of wound biologics market worldwide. In addition, rising demand of advanced biologics in the wound care treatment owing the high efficiency rate is projected to boost the growth of wound biologics market over the forecast period. In 2017, according to Global Diabetes Community, 422 million adults are living with diabetes worldwide, which is expected to increase to 642 million by 2040. However, the high cost of biologics and possible complications after undergoing wound biologics treatment may restrain the market growth. Moreover, increasing demand of innovative products for treatment is expected to create more opportunities for this market. Among the geographies, North America is expected to be the largest market for wound biologics followed by Europe. growing occurrence of chronic diseases and rising demand for recombinant factors are likely to propel the growth in this region. While, Asia-Pacific is expected to grow fast during the forecast period owing to high prevalence of diabetic patients in Asian countries. In 2016, Indian Diabetes Research Foundation states that over 60% of the world’s population suffering from diabetes lives in Asia- Pacific region. The report on global wound biologics market covers segments such as, product. On the basis of product the global wound biologics market is categorized into skin substitutes and growth factors. The report provides regional analysis covering geographies such as North America, Europe, Asia-Pacific, and Rest of the World. In this section the key trends and market size for each geography is provided over the period of 2016-2024. The report provides profiles of the companies in the global wound biologics market such as, Avita Medical, ConvaTec, Acelity, Cytori Therapeutic, MacroCure, Nuo Therapeutics, Molyncke Health Care, Osiris Therapeutics, Smith and Nephew and Organogenesis. The report provides deep insights on demand forecasts, market trends and micro and macro indicators. In addition, this report provides insights on the factors that are driving and restraining the global wound biologics market. Moreover, IGR-Growth Matrix analysis given in the report brings an insight on the investment areas that existing or new market players can consider. The report provides insights into the market using analytical tools such as Porter's five forces analysis and DRO analysis of wound biologics market. Moreover, the study highlights current market trends and provides forecast from 2018-2024. We also have highlighted future trends in the wound biologics market that will impact the demand during the forecast period. Moreover, the competitive analysis given in each regional market brings an insight on the market share of the leading players. This report will help manufacturers, suppliers and distributors of the wound biologics market to understand the present and future trends in this market and formulate their strategies accordingly.